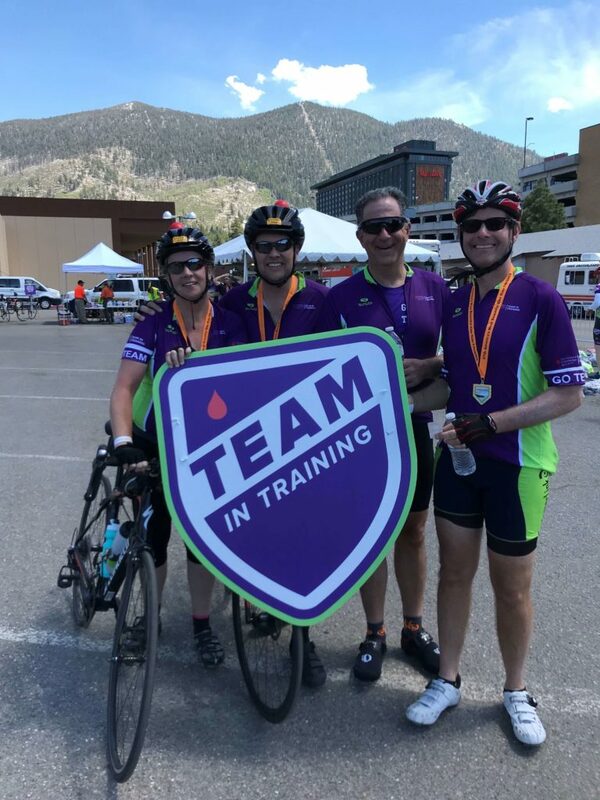 Roseville, CA – Curt Rocca, Managing Partner, and Craig Mitchell, Partner, both of DCA Partners, participated in “America’s Most Beautiful Bike Ride” on Sunday, June 3, raising much-needed funds for the Leukemia & Lymphoma Society (LLS). The 100-mile bicycle ride looped around Lake Tahoe, rewarding riders with beautiful views of California wilderness. The ride, coordinated by LLS’ Team In Training, raised over $4.7 million for lifesaving blood-cancer research, of which greater Sacramento-area teams collectively raised over $700,000. Mr. Mitchell showed no signs that this was his first century ride, as he led his team for many miles along the trail. Mr. Rocca, a long-time cyclist, was proud to participate in his ninth fundraiser for LLS. Both gentlemen have loved ones affected by blood cancer. Thirty-two team members, including Mr. Mitchell, rode in honor of “Super Fritz”, a five-year-old Rocklin boy who was diagnosed with B-Cell Acute Lymphoblastic Leukemia three years ago. They raised 108 percent of their goal, earning LLS over $108,000 for research. The team was formed three years ago by Chris Sena in honor of his close friend, Ron Ervin. Team “Ride-4-Ron” now rides in honor of someone new every year with the goal of raising $100,000 for a research grant in that person’s name. Mr. Rocca similarly rode as part of “Ride for Dads”, a team formed by Mary Caulder and Valerie Antkowiak, who both lost their fathers to blood cancer. They formed the team to improve the outcome for other fathers and daughters in the future. Team “Ride for Dads” raised almost $183,000—enough money for two new research grants dedicated in Mary and Valerie’s fathers’ names. Mr. Rocca was one of the top ten individual fundraisers out of over 1,000 participants in the event. Mr. Rocca and Mr. and Mrs. Mitchell raised nearly $60,000 for LLS in this event alone, and DCA is a long-time supporter of the organization. DCA Partners, LLC is the Sacramento and Central Valley’s leading Investment Banking and Private Equity firm. On the Investment Banking side, DCA helps family-owned and other closely held businesses grow through acquisition (buy-side advisory), or maximize the value they receive in a sale of the business (sell-side advisory). Similarly, the Private Equity Investment arm invests in growing family-owned and other closely held businesses in a broad spectrum of industries throughout the region. DCA can provide investment capital with very flexible structures for a variety of purposes, including growth capital, acquisition financing, and complete company buyouts. The Leukemia & Lymphoma Society (LLS) is the world’s largest voluntary health agency dedicated to blood cancer. The LLC mission: Cure leukemia, lymphoma, Hodgkin’s disease and myeloma, and improve the quality of life of patients and their families. LLS funds lifesaving blood cancer research around the world and provides free information and support services.